Mill-Max has added three new heights to the popular 0914 series of spring-loaded pins and corresponding single and double row connectors. The 0914 series has a mid-stroke distance of .045" (1,14 mm) [.090" (2,29 mm) full stroke] - close to double most standard series products. This provides more flexibility and tolerance for your assembly. These new, taller versions can be useful for assemblies requiring greater distance between mating surfaces and contact points. The current 0914-0-15-20-77-14-11-0 spring pin has an above-board height of .302" (7,67 mm), the three new versions provide an increase in height in increments of .030" (0,76 mm), see the table below for details. 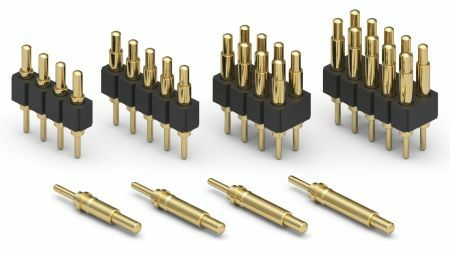 The new versions will also be used to expand the current 825-22-0XX-10-00X101 (single row) and 827-22-0XX-10-00X101 (double row) series connectors. The longer stroke provides great benefit in compensating for tolerance stack-ups and, combined with the increased height, makes them an excellent solution for elevated board stacking applications. The 0914 series spring pins have solder tails for through-hole mounting, providing the support necessary for taller components to maintain a secure connection to the PC board. Gold-plated brass components and beryllium copper springs ensure the highest conductivity, corrosion resistance and durability. The 825 and 827 series connectors feature the 0914-X spring-loaded pins rated at 2 amps continuous (3 amps maximum), use high temperature Nylon 46 insulators and are suitable for most soldering operations. For more information use the links to the right for additional product details, to order a sample, or to find related products. Need technical help or looking for a custom design? Use the form below to contact Mill-Max Technical Services.